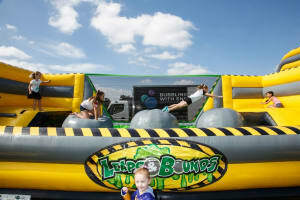 Large events, fairs, fetes, school carnivals, team building events, family fun days. Have you ever wanted to test your skills after watching the TV programme ‘Wipeout’? Well, now you can with our brand new Toxic Shock Big Ball Challenge, inspired by the Wipeout obstacle challenge. Bubbling With Energy’s newest arrival will be a guaranteed hit at your next party or event. This will provide entertainment for everyone. Specifically designed to challenge and amuse, the Toxic Shock Big Ball Challenge is not only fun and entertaining for the participants but exciting for spectators, too. This exciting new challenge features a series of three inflatable, grey balls where participants must make their way across to the other side without falling off. Climb up the ladder, onto one of the platforms. Then attempt to jump, run or hop over the toxic balls and make it to the opposite platform without falling off. Worried about falling? Don’t be, we have a patented unique fall zone with modern technology to absorb all sorts of awkward falls. So challenge all your friends, colleagues or family members to the Toxic Shock Big Ball Challenge. This obstacle challenge is suitable for all ages and events. We recommend the Toxic Shock Big Ball Challenge for birthday parties, team building events, family fun days, school and church fetes, neighbourhood block parties and college events and so much more. 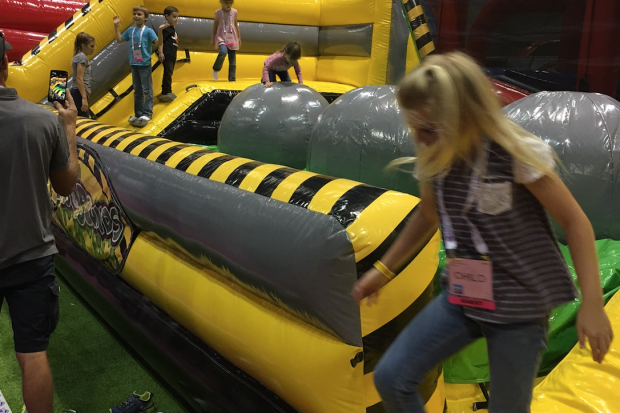 Accompany the Toxic Wipeout Challenge with some of our obstacle courses to bring your event to life. We have something for all backyard and event sizes. Lastly, for adult hires, Bubbling With Energy Entertainment will provide ‘Ride at your own risk’ wristbands, free of charge. 1.5m wide with no steps to the set up area.